4 In Stock. Sold in pairs (2) or as a set of 4 only! Save on this set of highly rated high performance tires. Featuring a strong performing directional tread design with the benefits of all-season traction for areas where snow is a factor. 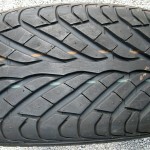 Be the first to review “Bridgestone Potenza RE960 A/S P215/55R16 93W” Click here to cancel reply.